Welcome to Heidi's home page. 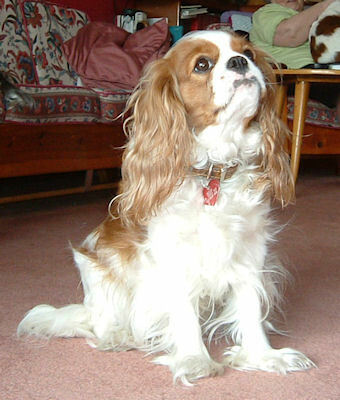 This adorable little Blenheim was our first Cavalier, bought by our son as a 'replacement' for Holly in October 2000, she was also the one who got us started into breeding. Having her first litter in September 2002 (Amber and Cassie), her second a year later (Max) and her third September '04 (Buffy and Chloe) we bred from her for the last time in 2005 with Wilfred (Tayfern Ptarmigan) when she gave us four very nice, and almost identical, Blenheim puppies (Poppy, Maximus, Harvey and Diesel) - but as a result of being born by Caesarean and spaying (and age) she was well retired but still liked to keep a maternal eye on everything and wouldn't have known how to stop if she tried - apart from going out in the rain that is, which she hated with a passion! Sadly after recovering from a double cataract operation a few years ago, followed by almost puncturing one of her eyes on a thorn, she developed an ulcer in her left eye which would not respond to treatment and just kept growing, so sadly we had to make that final vets visit. 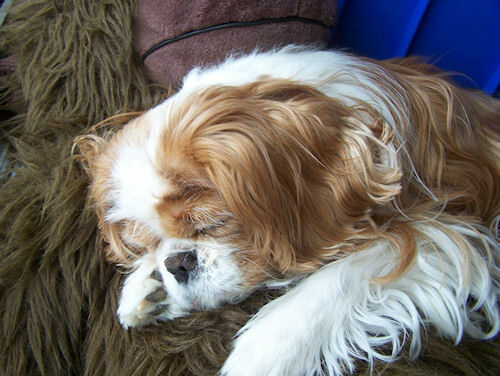 At least she is home with us - not only because she is buried in the garden but she will always be in our thoughts and memories, together with keeping her web pages as part of our site.